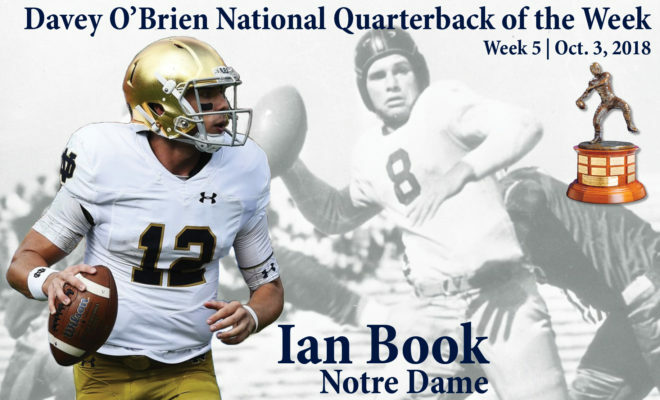 FORT WORTH, Texas (Oct. 3, 2018) – Notre Dame junior Ian Book is the Davey O’Brien National Quarterback of the Week for week five, the Davey O’Brien Foundation has announced. Book guided the Fighting Irish to a 38-17 victory over No. 7 Stanford on Saturday night. Through the air, he was 24-for-33 for 278 yards and four touchdowns with no interceptions. He also added 47 rushing yards on 15 carries. Book’s final two touchdown passes came on consecutive throws in the fourth quarter to blow open a 7-point game. On Monday, he became one of just four quarterbacks in the nation to earn Davey O’Brien Great 8 accolades in back-to-back weeks in 2018. The other Great 8 quarterbacks in the season’s fifth week were: LSU’s Joe Burrow, Will Grier of West Virginia, Fresno State’s Marcus McMaryion, McKenzie Milton of UCF, Oklahoma’s Kyler Murray, Nathan Rourke of Ohio and Western Michigan’s Jon Wassink. The Punt & Pass Podcast will discuss Book on Thursday’s edition of the show.